This is a Dave’s Bread Corner recipe in disguise. I know, you’re thinking cookies aren’t bread at all but my husband loves cookies and aside from bread they are one of his go to baked goods to make. A common pattern when he’s in the kitchen baking is that he prefers no-fuss recipes. If a cookie recipe says to chill it in the fridge for a while or calls for “odd” ingredients he will often look for a different one, or more commonly simply adjust the recipe to not involve them. This recipe was invented by him while he was half asleep. He woke up and was apparently thinking of cookies one morning and rambled off how he would make a new tasty cookie and which ingredients he would use. The result was this recipe. 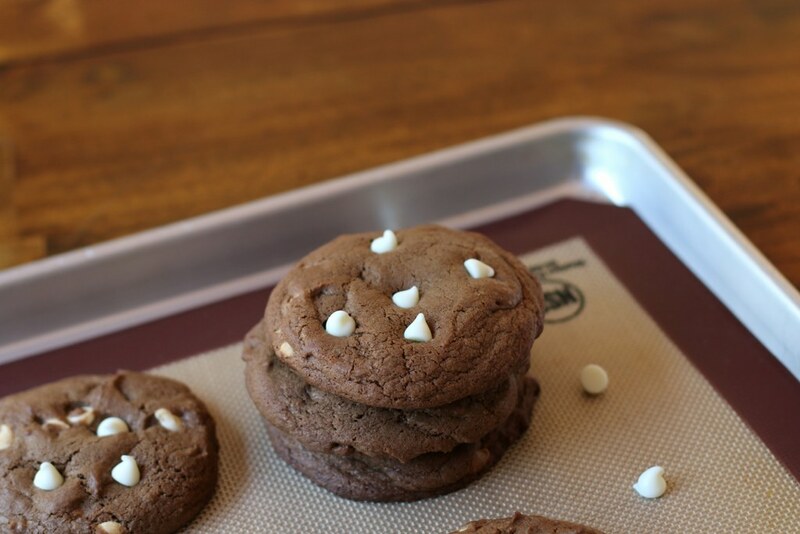 It’s a lightly chocolaty cookie with white chocolate chips. The goal was that the standard chocolate chip cookie base flavor still shined through. It’s his personal favorite cookie base and he’s even been known to make batches of them without chocolate chips at all just so he could enjoy the flavor without anything else in the way. These weren’t just invented by him, he’s also the one that baked them for the blog. Line a baking sheet with a silicon mat or parchment paper and set it aside. 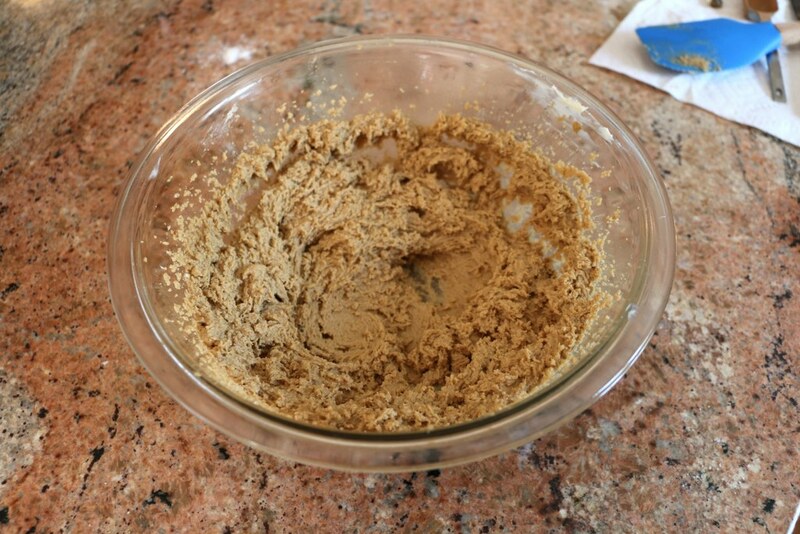 In a medium bowl, whisk together the flour, baking soda, salt, and cocoa powder. Set the dry ingredients aside. Cream the butter, white sugar, and brown sugar. Stir in the white chocolate chips with a spatula. 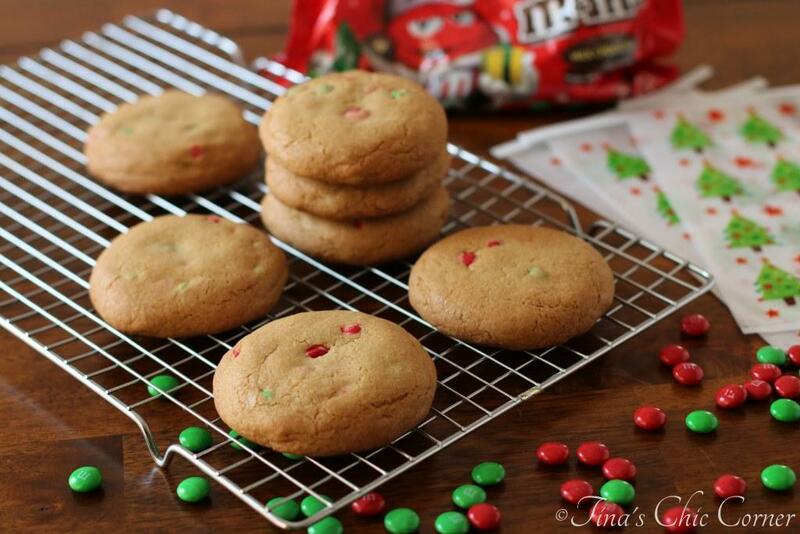 Use a 1/4 cup measuring cup as the portion for each cookie. Bake them four to a tray in the preheated oven for about 15 minutes. This represents what my husband describes as “properly creamed” butter. You have to put in the time because, well, you just do. If you wimp out and stop early the texture of the whole cookie can end up weird. To paraphrase Alton Brown, you need the sugar crystals to poke holes in the fat molecules and you need to give it the time to do that. The cocoa is a dry ingredient here because melting chocolate bars is too big of a pain. As a kid, my husband always enjoyed “barely chocolate” milk. Just like any other kid’s chocolate milk concoction except with no where near as much chocolate. These cookies follow a similar goal. Get the chocolate in there, but just enough to make you smile without taking over your entire palate. In the vein of seriously fuss-less cookie making, this cookie dough was never chilled. It also wasn’t man-handled when portioning out the cookies. It was simply dolloped 1/4 cup at a time onto the pan and considered good to go. They may look lumpy and tall at this point, but don’t forget that all that butter will melt and gravity will prevail. 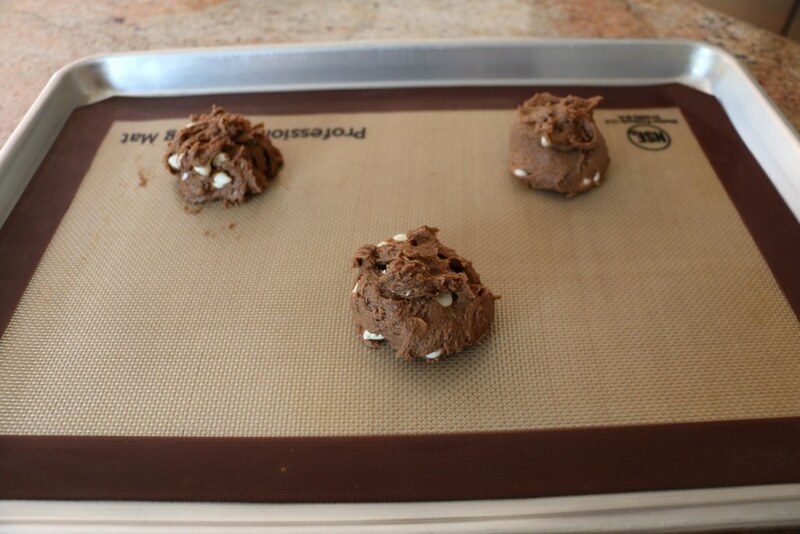 They will become cookie shaped all on their own while they are in the oven. For his first batch he wasn’t sure how much they would spread so he made only 3 cookies instead of 4 on the pan. All of his follow up batches were 4 cookies each and they didn’t bump into each other. They are chocolaty but not too chocolaty. One might say there is a hint of chocolate. 🙂 They are chewy on the inside and a tad crunchy on the outside. Look at all those white chocolate chips! I love the white and chocolate contrast. Silicon mats are amazing! We started using them only a couple of years ago and I can’t believe it took us that long. With all the baking that we do they are totally worth the investment. Now I never have to wonder if we need to grease the baking pan because we just don’t. My husband baked these cookies the same day that I baked the Sprinkle Cookies. I love baking in the kitchen together. 🙂 Unlike him, I’m willing to bake with shortening and corn starch, chill my cookies, roll the measured out dough into nice clean shapes, and fuss with the presentation. Perhaps it’s the food blogger in me. 😉 I chose to honor his no fuss cookie-dom by photographing his creation in the most no fuss way possible. What about cookies makes you happy? Here are some other crazy good cookie creations. Just the way I like them. Too much chocolate, for me, actually ruins the flavor for me. Oh, man. I want/need this cookies in my life like yesterday. Your photos make me wanna reach through the screen and grab a handful! Can’t wait to try these, Tina! These cookies sound delicious – and really just about everything about cookies makes me happy! I’m with ya…everything about cookies makes me happy too! What’s it like to be married to a culinary genius?! Sometimes I just want the c.c. 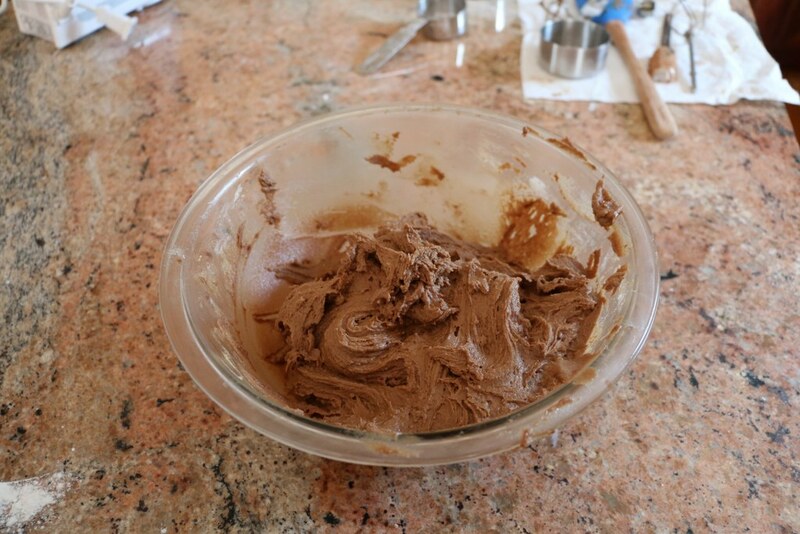 cookie base too…and to make it slightly more chocolaty! So smart! These look delicious! Oh yum! They look scrumptious! I love the white chocolate chips on top! I forgot how much I like white chips…I kept eating them while he was baking. 🙂 Thanks for stopping by! Silicone mats are absolutely amazing, right? I love using mine to bake cookies too, they always come out so much better. These cookies look delicious too! I love the touch of chocolate in these, chocolate just makes life better. You are so right about these mats…and about chocolate! 🙂 Thanks for stopping by. Oh wow – these look so great!! And I love that he first concocted these beauties when he was half asleep haha. That’s a danger zone for me in that when I’m tired I’m much more likely to pull bonehead moves like forgetting the leavening ingredients or doubling the butter (both have happened). It looks like Dave pulled these off perfectly! I wish I had a batch warm from the oven right now! Alyssa, I’m totally the same as you…haha…too funny! White chocolate chips are my favorites! I’m always in the mood for chocolate chip cookies and I wish I had a jar of these right now! You hit it right on…I’m always in the mood for a chocolate chip cookie! Gosh, I wish there were some of these leftover! I am a little jealous that your hubby bakes cookies!! 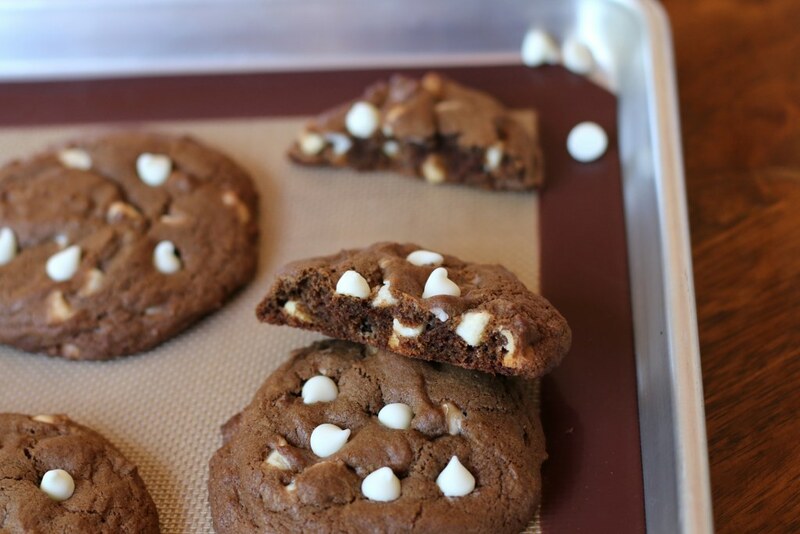 These guys look so delicious, love the dark choc cookie, white choc chip combo! I’m definitely a lucky girl. 🙂 Thanks for stopping by! These cookies seem like the perfect balance of chocolates. 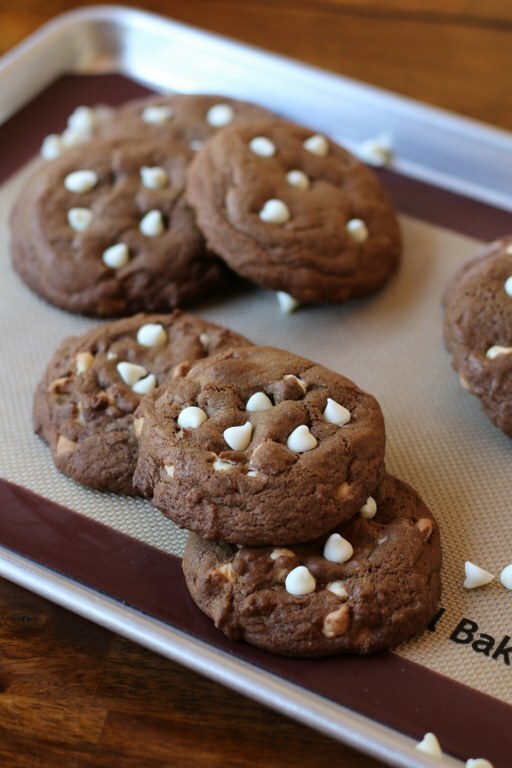 I love the chocolate cookie with the white chocolate chips! 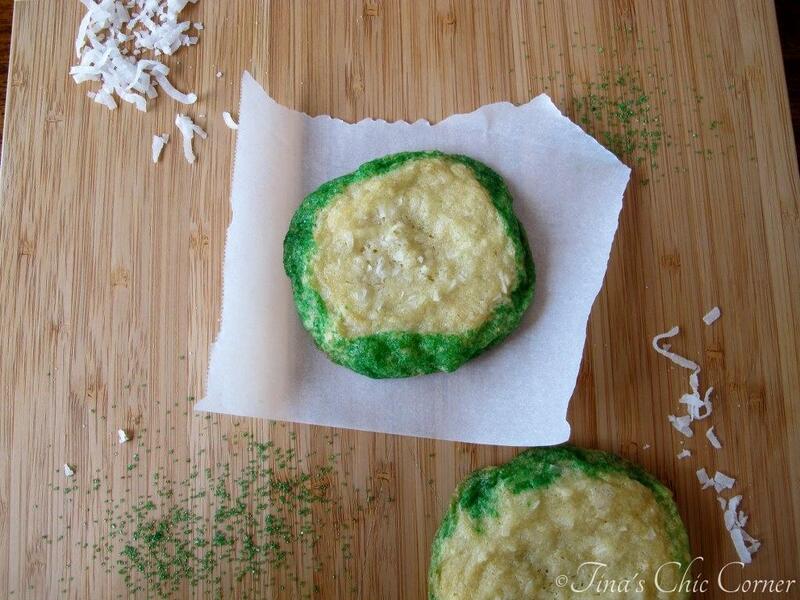 Crunchy on the outside and chewy on the inside=cookie perfection. These cookies look amazing and I respect your husband for being so casual about cookie making and having them turn out so perfectly! I’d be a little OCD like you! 🙂 Great post, Tina! To the kitchen I go to bake these bad boys. Everything about cookies make me happy, I think I associate cookies with being a kid (little, like 5 years old), we’d have a cookie with a glass of milk and Mom would read us a book to send us off to sleep. Oh to be a little person again. I’m not a huge chocolate lover, but I get totally get behind this hint of chocolate flavor! 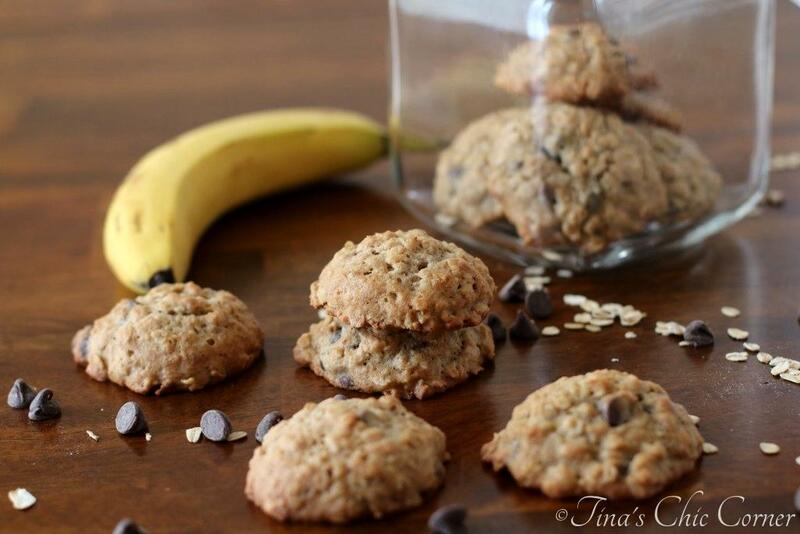 Tina these cookies look amazing – but your photos are gorgeous!!! What an amazing husband! I think I’d let him have free reign over inventing cookies whenever he wanted too! Your photos are making me cookie hungry. I love anything with chocolate especially cookies. You married a true foodie…waking up with recipe ideas 🙂 Love the two types of chocolate here!